The singer also opens up about stage fright and how touring made her "more concerned about the world"
Don’t get her wrong, she cautions—she feels honored and privileged that fans flock to see London Grammar, and that they gobbled up its new Paul Epworth/Greg Kurstin co-produced sophomore set, Truth Is a Beautiful Thing. So an artist can’t really get annoyed at the way their craft is being consumed. “But standing up there onstage, I was just marveling at how every other person had a phone and was filming us, and that footage will exist forever, and it may exist online. It changes the pressure, I think social media—it makes it a little harder.” She’s hoping that in the future fans will put their devices away to enjoy firsthand elegiac new English-folk-flavored anthems like “Big Picture,” “Rooting For You,” “Who Am I?” and “Leave the War With Me.” But she understands the cellular urge, she says, “because we’re not just giving a one-time gig anymore.” She expounded on this and other subjects in a rare interview last week. Paste : Do you remember the first time you sang for others? Hannah Reid: I have memories of singing for maybe a couple of people, like a music teacher at school. And probably the only other person was Dan [Rothman]. And I remember singing well, but those moments kind of came and went, although I guess they might seem more significant now. Paste : Were the teacher and Dan both blown back in their chairs like the Memorex tape guy? Reid: The teacher was. In fact, he almost fell off his seat. But I think when you’re young, you don’t really believe in it all that much. He said that I should be in the choir, and I did join for a bit. But I actually was more interested in going out with my friends at the time. But that teacher let me record the songs I was writing at the time on my lunchtimes in his little music studio. My songs then were probably a bit more teenage-angsty. I remember my first boyfriend dumping me, and that was pretty devastating. So I ended up writing about him, which is kind of funny now to look back on. They were probably all really terrible songs. But it’s weird—the important moments you don’t really remember. So I seriously don’t remember Dan’s reaction. But my voice is something that’s changed a lot over the years. I’ve really become a much better singer now. And I do have that folky voice in some of our new songs, so I think my voice has definitely matured and our song ideas have matured as well. Paste : How did you guys even meet? Reid: We went to university together in Nottingham, and I was studying English and art history. And I had no plans to end up being a singer in a band—it just kind of happened. Daniel saw a picture of me on Facebook with a guitar, and he just asked me, “Do you write music?” And I said, “Yeah, I do—I write songs.” And he said, “Oh, I’d love to hear you play.” So I just went to his room, because we were in the same residence hall, and we kind of played this song together. And he didn’t say much. He was a man of few words, in some ways. But he was like, “Yeah! We should jam!” So I met Daniel, then Daniel met Dot, and we just built something together over a long period of time. Paste : Your voice is such a delicate instrument, you could easily blow it out on tour. Which you actually did, right? Reid: Yeah. That did happen. And it was a really weird thing, because you don’t think that that can happen to your voice, so I didn’t really know what was going on. And it is a muscle, so it was sort of like being an athlete, in some ways—I had to learn how to schedule our time properly, and learn what my voice needs. And there was just no point in going against that, because otherwise you just end up canceling shows. And it was very disappointing for fans sometimes at the end of that period, when we had to keep canceling. But it happens so much to bands an artists, because you just start touring and you don’t really know what you’re doing. So I got vocal treatment options, and now I actually use Manuka honey [from New Zealand]. A lot of singers use that. Paste : Was it weird, returning to London after being so successful with If You Wait? Did your friends treat you differently? Reid: I’m really lucky—I never had that experience. My friends remained my friends, and they’re still my friends now. I’ve got a group of core girlfriends who have never treated me any differently. But I do think that touring, if it’s not done the right way, can lead to isolation sometimes. But I got lucky, because all my girlfriends were really supportive, so coming home was an adjustment, but it was lovely. Paste : If You Wait seemed deeply personal, in tracks like “Shyer,” “Nightcall” and “Wasting My Young Years.” Truth feels more universal, oblique, metaphorical. Reid: Yeah. I would say that’s probably true. But I kind of write songs and I write lyrics, and how they come out is just how they come out. But I did, on some songs, have something that I really wanted to say. And in a different way than I had the first time. And the song always relates back to something that’s quite a personal experience for me. But maybe that’s what touring kind of does—it did open my eyes up to things that I hadn’t really seen before, and it made me much more concerned about the world. But I wouldn’t say that I’m a politically driven artist, like, “Hey, there’s something political going on! I’m going to write a song about it!” But I do think if you’re an artistic person, you end up absorbing what’s going on around you. And there is this horrible instability that people are feeling at the moment, and me, Dan and Dot took some of that in. So I think that art will always reflect issues that are going on in the world, no matter what. Paste : You once said that you really missed that innocent time from childhood, when you would race down to your local record shop on new release day to buy the one record you’d been eagerly awaiting, then listen to it all the way through. Your album had that vibe this year; Lana Del Rey’s, too. Reid: She does have that. And it’s interesting. I was at her concert a couple of nights ago, and she’s just a raw phenomenon. And I really feel like she has such a loyal fan base, where people really are just counting down the days to when her album comes out. And I think that’s becoming harder and harder to maintain now, as a musician, in this kind of streaming world that we live in. Music has a different value now, which is harsh. And it really is a problem. And now festival and concert tickets have become really expensive, because that’s the only way that a band can afford to tour. And we’re not complaining—we make a very healthy living from what we’ve done and what we’ve achieved. But there are loads of really talented artists who’ve gained success from streaming, but then they find it really hard to make their living from it. Paste : Well, you’ve often said that you chose the wrong career yourself, since you’ve always suffered from debilitating stage fright. Reid: Yeah. And I do remember always being like that as a kid. I never enjoyed being in front of loads of people, so I think it’s just genetics and personality. But it is still very physical for me, even though I’m so much better now than I was at the start. But there’s a funny thing that happens sometimes in music. You can write a song alone in your bathroom, and those people tend to be introverts. But then there’s this whole other side, this career of performing those songs in front of people. Which is an amazing, wonderful opportunity. So artists just need to find the right way to then cope with that pressure. And I know some artists are just born to do it, so it just depends on which category you fall in, really. 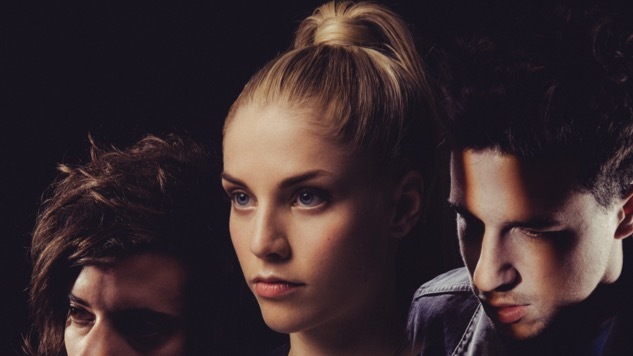 Paste : You have a song called “Sights.” But now, thanks to London Grammar, you’ve traveled the world and seen a few. Paste : In Britain, it’s quite interesting—there’s a whole movement of female-fronted bands, yours among them, like Wolf Alice and The Big Moon. Reid: Yeah, and it is really awesome. I mean, there have always been amazing female artists when you look back on the history of music. But there’s just something about the female voice, I think, and there’s something about creativity that has a very feminine energy to it, whether it comes from a man or a woman. And I personally find that my relationship with my music and the songs that I write is totally tied into the fact that I am female. Paste : Just imagine if America currently had a woman president. Reid: [sighs] I know, I know. One day, though! One day!